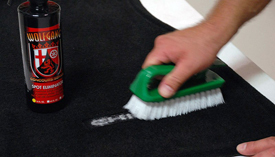 With Wolfgang Spot Eliminator tough stains and stubborn ground in dirt don’t stand chance! I followed direction to a tee and even applied a second time with no noticible difference. I was trying to remove normal soil from cloth seats., not even a stain. Save your money and time ! Great product. Took far more applications than expected for the driver side mat but still did an superb job on a 7 year old Lexus. My wife is the only driver, too! I used the above product with good results I did have some difficulty when using it on salt stains requiring a second treatment. I did not get factory looking results but received the best look I could considering the stains. I have a light grey interior and front passenger carpet was very badly stained. I expected to have it professionally steam cleaned, but gave this product a try first. WOW - it looks nearly new again. I am very impressed. The Wolfgang carpet and upholstery products are the real deal. This spot eliminator is amazing. 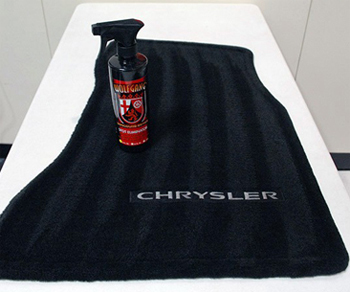 Removes stains and softens dirt and solid's so there easily wiped away. Also leaves protection. 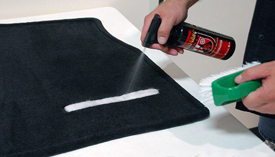 I use this for spills and the carpet cleaner for an entire routine cleaning.